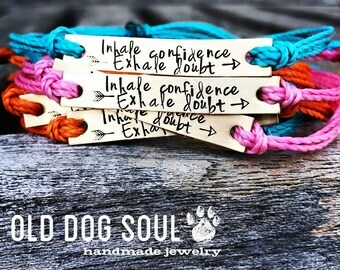 Old Dog Soul- handmade jewelry is a collection of handmade & hand stamped funky, fun, whimsical, one of a kind statement pieces inspired by you! Each piece is handmade by me in my own little shop. Every letter of every word is individually stamped one at a time. I put 100% of my love and energy into each creation striving for perfection. 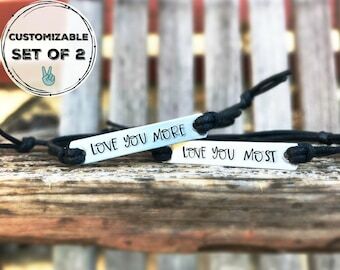 I hope that you enjoy looking around my shop, and I hope to create with you a unique piece of handmade jewelry to start off your collection! Processing time is about 5 business days. I am usually able to complete your order on the lower end of that scale. Please take into account that Shipping times are not included in "processing time"
for US shipments- Flat rate shipping can take up to 2-5 days, Priority is 1-3 days. I recommend priority if your concerned about overall turn around time. Contact me for more information on delivery times for bulk orders. So nice and such detail! Definitely recommend and will be purchasing more as gifts soo ! 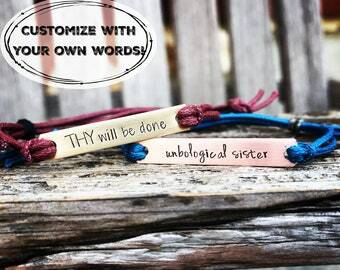 The double sided bracelet comes with many cord color options!! So cute! Having fun with the photo shoot! 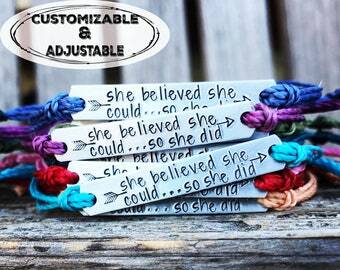 The possibilities are endless with this style of bracelet!! 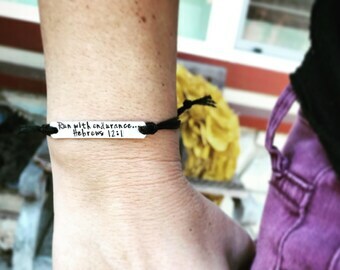 Wear it alone or stack it with tons!! It’s up to you! My name is Jen and I would love to tell you a little about my story. About 4 years ago my husband and I decided that I should take a leap of faith and quit my job to be a stay at home mom for our 3 young sons. 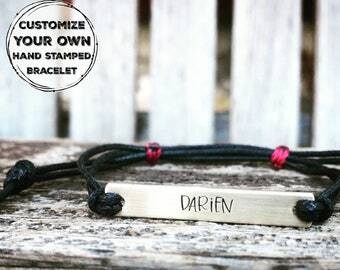 Hand stamping jewelry was a learned skill and through the support of friends and family I made the decision to open up an Etsy shop. 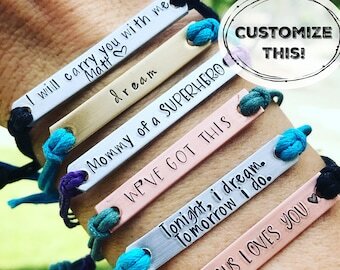 Here I am on my 4th year with my Etsy shop and I still plugging away at making hand stamped jewelry. With every order I get from YOU my customer pushes me one more step forward. I get to create so much cool stuff with YOUR help. YOU are the ones that inspire me. YOUR quotes and phrases to the stories YOU tell me are amazing and I am thankful that you let me into your life like that. All of YOU are the reason I am still here providing my version of art jewelry. OUR collaboration brings me so much joy each day and I want to thank you for that. 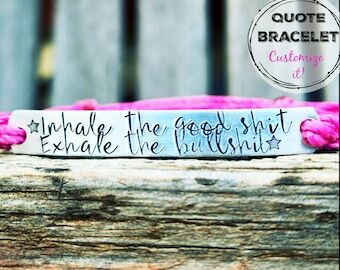 When I stamp out each order I do it with love and passion. I want to provide the best quality material and service for you. 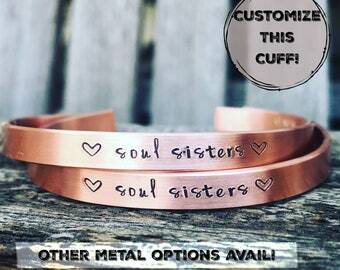 Welcome to Old Dog Soul- Handmade Jewelry! 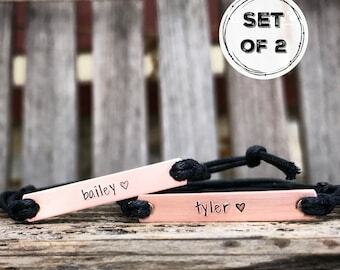 Custom and personalized hand stamped orders are not refundable unless a mistake on my behalf has been made, then of course I will work to fix the problem immediately! Contact me with any questions or concerns. Buyer is responsible for return shipping costs. Refund of the item will be made to the buyer once the item is received. If you have not received your package and have not had any luck tracking it down via the tracking number you receive once your item has been shipped, please contact me and I will direct you as to the best way to track it down. I accept Credit, debit and paypal payments. Production on your order will not start until payment is received in full. 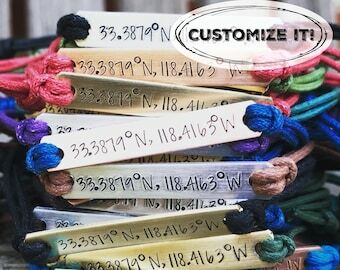 Your order will be shipped in a padded envelope via USPS first class mail to the address you provide in Etsy. If you wish to have your item sent to an address different from your billing address, please provide a "ship to" address on the submit order page by selecting the "change shipping address" option. Shipping upgrades to priority and express shipping are available via the "pull down menu" when ordering, should you wish to ensure a quicker delivery than first class mail.